Starting in January 2003, a slight rumble starting coming from the front end. As time passed, it got louder and louder, eventually causing a vibration and gentle pull on the steering wheel. A quick inspection of the front wheels indicated that the driver's side "sealed lifetime" bearing was on it's way to toastville. 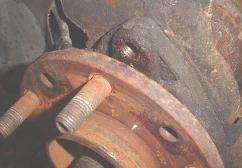 Since the bearing comes pre-assembled as a hub/bearing/ABS sensor, it's quite expensive, upwards of $451 GM dealer list. We were able to order one via GMPartsDirect.com for a shade under $300 delivered. 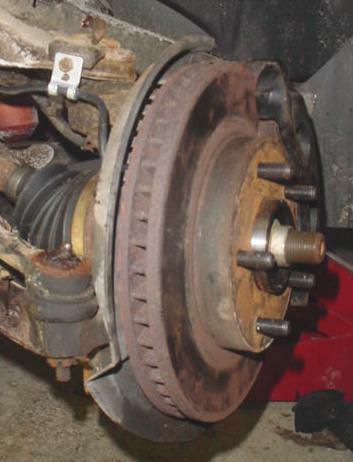 Below is the front wheel assembly. For a 2000 truck, things have gotten pretty rusty. 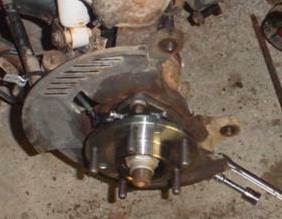 The second shot has the rotor/caliper removed and the hole you see is the upper bolt for the hub assembly. 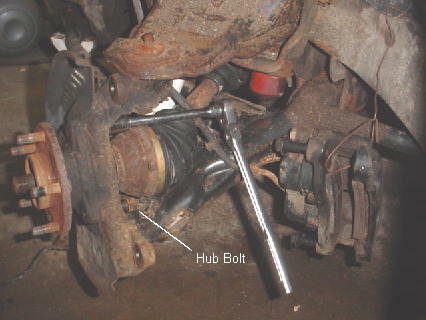 The hub assembly is held on by 3 bolts, two of which are shown here (the wrench is on one). 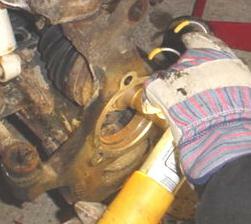 Once all the bolts were removed, an overnight soaking in penetrating oil was required to get the hub off the steering knuckle. Here are the new and old parts together. The ABS cable is quite long and has three mounting points (GM provides the first, you need to reuse the other 2) that attach to the truck before reaching the plug on the frame rail. 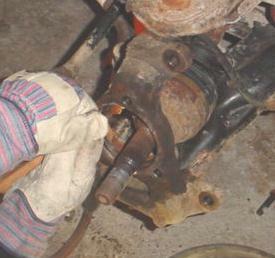 After we cleaned the steering knuckle, the new hub assembly was installed. Here is the final assembly. 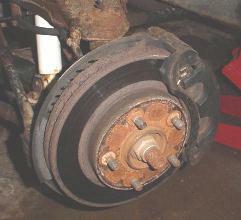 Lock-tite was applied to the 3 hub bolts and installation was reverse of removal. 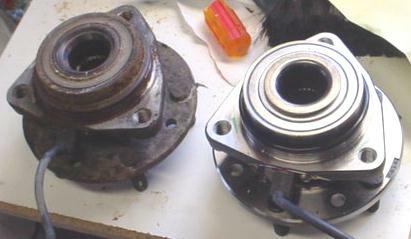 The rotor covers most of the hub with all but the center section and the studs showing. After all is said and done, everything worked out well. After ~2 hours of labor, the truck is back to normal.